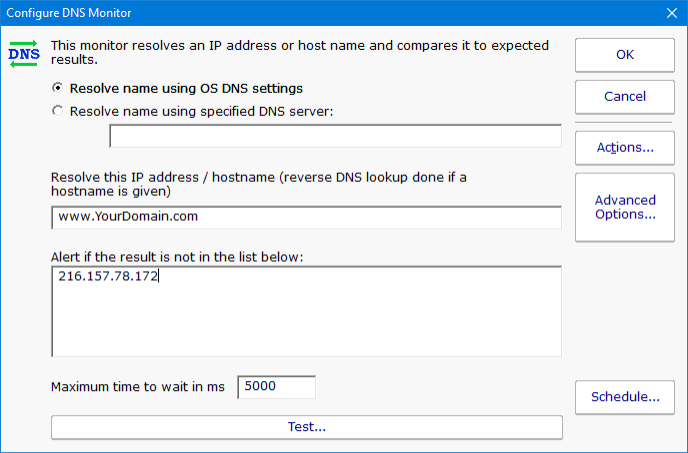 The DNS monitor will resolve a hostname, or do a reverse DNS lookup on an IP address and return the hostname. The result is compared to a list and if the result is in the list, the lookup is considered successful. If the lookup returns something not in the list, or the lookup fails, the monitor fires actions. You can specify the local computer's DNS server settings should be used, or you can indicate a specific DNS server to send the request to. If the specific DNS server can not be reached or returns an error, the monitor will fire actions. If you are resolving hostnames, and a CNAME record is returned (something like www.poweradmin.com -> poweradmin.com) the resulting hostname will be looked up so that the final result is an IP address. Though it's uncommon, chained CNAME records can be followed.